Top ergonomics thanks to flexible adjustment options. In the age of RGB-lit motherboards, graphics cards, mice, keyboards and monitors, a matching gaming chair was needed in order to complete the scene. The Nitro Concepts S300 is breaking new ground, combining optimum ergonomics with extravagant racing looks in bright colours. This symbiosis makes it the ideal gaming chair for lifestyle-conscious gamers. Fresh Design with Intense Colours! The Nitro Concepts S300 Gaming Chair is setting itself apart with its new unique combination of vibrant colour designs. Combined with premium materials, gamers won't just be able to make exercise their imaginations, they can also expect a wide range of adjustability options as well as optimum ergonomics. The Stealth Black variant is coated in a durable cover which is soft, high-end and extremely breathable. In combination with the porous cold foam upholstery the S300 gaming chair offers a pleasant seated experience on warmer days. For every other day the deformation resistant cold foam provides a high degree of comfort even over long periods of time. To ensure that the breathtaking design of the S300 series can be enjoyed over the long term, first-class upholstery is used atop an extremely stable steel frame. The high quality materials of this comfy gaming chair ensure that no one has to put up with squeaking and creaking or rapid wear and tear. The combination of outstanding German engineering with high-precision mechanical manufacturing ensures a flawless and extremely durable construction. The Nitro Concepts S300 gaming chairs do not just offer impressive highlights, however. The embroidered flame of the Nitro Concepts logo in the headrest lends the S300 series that certain je ne sais quoi to make it unique. Furthermore the chair's base also comes with matching colours thanks to the plastic decorative strips. The S300 series represents an advancement on the previous Nitro Concepts chairs. The new gaming chairs are fundamentally more open in design terms and offer a marked increase in terms of surface contact area, allowing the ergonomics to undergo a dramatic improvement. Even the seat are as well as the backrest have been optimised. With a 56 cm wide backrest and a 57 cm wide seat area, sitting on the S300 gaming chair is sure to be comfortable. The porous, deformation resistant cold foam serves as upholstery and can boast of superior durability thanks to its thickness, which has been optimised to meet the demands of gamers. As a result it is not only breathable, but also capable of maintaining its form over the long term. The distinctive shell design also maintains the unmistakable look of a racing seat. If you've had the pleasure of sitting on the Nitro Concepts S300 gaming chair, you'll be reluctant to get up again. The fresh, vibrant design combined with numerous ergonomic adjustment options only adds to the effect. The chair is equipped with a robust and durable Class 4 gas lift allowing a 13 cm adjustment from 48 to 61 cm in height. The integrated rocking mechanism enables you to lean back to 14 degrees. Furthermore the S300 series offers an adjustable backrest as well as flexible 3D armrests. With such an extensive range of ergonomic options you are guaranteed to enjoy the perfect posture! Nitro Concepts has used 3D armrests to set new standards in comfort. Due to their superb flexibility they are ideal for the sport-orientated approach of gaming chairs. They can be adjusted comfortably in three dimensions and they allow any user to make them their own. Those who like to recline while gaming not only have the option of using the rocking mechanism, but also adjusting the backrest itself. With an angle ranging from 90 to 135 degrees you can both sit back and relax during play or take a short nap during a lengthy load screen. Appropriately enough Nitro Concepts also offer two comfortable and ergonomic supporting cushions for the neck and lumbar regions. A durable nylon base serves as the foundation of the S300 Series. Its five arms are highlighted by the addition of coloured accents and equipped with quiet castors. The 50 mm castors are made from a hard nylon core with a soft polyurethane covering. This means they not only run quietly over flooring, they do so both on hard as well as soft floors. The gaming chair is equipped with a stable base and the hydraulic lift is rated Safety Class 4 supporting loads up to 135 kg. More links for "S300 Fabric Gaming Chair - Stealth Black"
Such a great chair for th eprice! Can't get anything better for the price! Such great quality and build for the price, I bought 2, one for me and one for my son! Very comfortable and great to sit on fabric instead of leather for a change which makes the chair feel very different to others. Base is nice and firm and whole chair feels solid. Easy to assemble (10mins). The arms were already attached and were very sturdy, no wobble at all. I like that they are multi-position arms. Rock motion spring could be a little lighter, otherwise a great chair for the price. One of the best chairs I've ever sat on. I have tried several gaming chairs but the feeling when i sit on this chair is unreal. The chair comes with two attachable cushions, one for the lower back and one for the neck, maintaining a very good S shape for your spine posture while sitting. I had a lower back injury in the past and I suffer from lower back pain especially when I sit down for long time in general, but this is not the case when using this chair! This gorgeous chair is made by good quality fabric so forget about leather pealing or discoloration. Choosing black color will look smart and at the same time it will make your life easier on maintaining it clean. Last but not least, there is something for me that needs to be added to the cons. The base is plastic made (same as most of the chairs) and within a weeks use one of the wheels came of because the base got broken at the point that the castor wheel goes into the hole (my body weight is 80kg). Overclockers with their amazing customer service sent me a new base free of charge and now my chair is good as new. Another thing to mention is that the castor wheels are very basic, plastic made and not rubbery. If the chair will go on a hard surface you will definitely need to upgrade them with better quality ones. "The Nitro Concepts S300 offers a great array of adjustment and comfort for the price, and it’s also a great choice if you prefer the feel (and reduced squeaking) of fabric over faux leather." "The build quality is excellent too. Many gaming chairs feature really cheap padding and material. Sure, they look great, but they’ll wear out in a few months and you’re shopping for another. The fabrics and materials used for the S300 are much more durable and long-lasting. Of course, you get what you pay for." "Nitro Concepts have done a great job of incorporating the most important features in their S300 Gaming Chair. The S300 is made from all quality components and looks as good as it feels to sit in it." 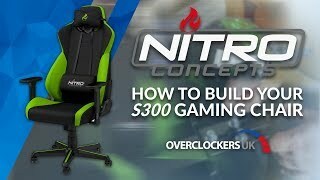 "Overall the Nitro Concepts S300 is a chair that feels comfortable, is easy to assemble and is made to last. It’s not the most aesthetically exciting but we think that it provides good value for money when it comes to Premium Gaming chairs." "Searching for a striking gaming chair to match your gaming battlestation? The Nitro Concepts S300 offers a huge range of colours and comfort to boot." "It is a very nice comfortable experience... I definitely recommend the chair if this is witihin your price range!" "To finish I have great pleasure in awarding the Nitro Concepts S300 chair a Gold Award, as it sits well above budget offerings without going too insane on the price, the quality offered should ensure the chair lasts years." EK-Cable Y-Splitter 2-Fan PWM is a simple adapter used to hook three (PWM) fans to one motherboard 4-pin PWM or 3-pin DC FAN connector.